John, my assumptions (and these are just what hey are, not facts, nor presented as such) are based on previous BM cameramexperience with the Original Pocket Camera, and both Micro Cameras, all of which only had the 3.5mm unbalanced input. The input on all three was also weak, but it seems from other reported tests her, it is also weak. My info on the new Pocket performance is based on Robert Niessner (who also has extensive pro audio experience) and others, who’s opinion I trust. And yes, there is alway variation on different camera samples, due to the quality control issues BM seems to have in their Camera production. I also have the original Ursa and Ursa Broadcast Cameras. Audio has always been a weak point on the BM Cameras. The Ursa Mini Pro to date has the best audio so far. I had high hopes for the new Pocket 4K, based on reports from preproduction Camera tests, but it appears this has not planned out, as the new Pocket suffered from weak audio inouts on its 3.5mm input, the jury is still out on the XLR inkut, which seems a little better, but how is it compared to the UM Pro? Denny, there's evidently no stopping you from offering advice and instruction on every conceivable subject, whether you know anything or not. If your own errors haven't shamed you by now, I guess it's pointless to say more. John.. that is a bit harsh. Denny knows a ton and has offered plenty of fantastic advice in many posts. He, like many of us is just sharing thoughts, sometimes formulated from others possibly from several other forums to help would be readers. There is nothing wrong with communicating thoughts, ideas, and expertise, in any combo in an open forum. If he is wrong, he has come forward saying so. Whats the big deal? Lets all enjoy the sharing of info and be cool to one another. Justin. We have been ripped off for many years. Most of the things we talk about are things worth dollars to add, probably in total. This $59 prepaid, fillin, phone is likely more complex. The only reason the pocket is good value in reality, is they have done what they could with FPGA. The camera if done differently, is sub $500 value. You can pickup $299 m43rds 4kp30 camera (but with 1080p HDMI) which just uses it's design differently, but illustrates reality. I have great hope for a new micro, mini and next pocket. After they figure out what is wrong here they can sort out and even upgrade (HDMI). I'm not saying they should reduce the price to $500, unless they get something cheaper to replace FPGA, which could halve the size, with a new sensor. I wonder if that $299 (with lens maybe) m43rd special, could he programmed to do cdng or raw output. I've been waiting firbthe next version for a couple of years maybe. Justin Jackson wrote: John.. that is a bit harsh. Denny knows a ton and has offered plenty of fantastic advice in many posts. He, like many of us is just sharing thoughts, sometimes formulated from others possibly from several other forums to help would be readers. There is nothing wrong with communicating thoughts, ideas, and expertise, in any combo in an open forum. If he is wrong, he has come forward saying so. Whats the big deal? Lets all enjoy the sharing of info and be cool to one another. Rakesh Malik wrote: Since there's really no such thing as phantom power on 3.5mm, it would be pretty pointless. The 3.5mm jack is a consumer standard, not professional... and that comes with compromises. The Pocket 4k has plug-in power on the 3.5mm jack. My lavs need it and they work. Plug-in power and phantom power are two different beasts. Different voltage, different wiring, different plugs, different construction of connected microphones. Last edited by Johannes Hoffmann on Tue Nov 27, 2018 3:29 pm, edited 1 time in total. Have there been any tests on the camera that give a definitive mic gain specification in mV or dbm, most of the comments so far are of the subjective 'this is quieter than that' kind, would be nice to have an accurate figure. All of my Sony cameras come with the audio specification printed in the manual, BM do not seem to do this. Richard Knight wrote: Have there been any tests on the camera that give a definitive mic gain specification in mV or dbm, most of the comments so far are of the subjective 'this is quieter than that' kind, would be nice to have an accurate figure. All of my Sony cameras come with the audio specification printed in the manual, BM do not seem to do this. I have been testing my 4K inputs using a 1kHz tone and a meter to look at volts RMS vs recorded db. In short, the 4K is 12db less sensitive than the old BMPCC on its 3.5mm input when the 4K is set to stereo and 6db less when set to mono in both line and mic modes. A 0db signal (about 1.7V RMS) gives about -12db on the BMPCC4K in stereo and 0db on the old BMPCC. I can't see any sense in why it should make a difference to sensitivity whether the input is set to mono or stereo on the 4K. Another observation I made is that the metering on the old BMPCC is inaccurate. There is a non-linear relation between db input and display, with it being about right at higher signal levels but reading too high at lower signal levels. 0db was correct on the camera but a -20db signal displayed as -15db. I verified that by doing recordings at various levels and checking them in Audacity. I also used a BitScope Micro to check signal levels agreed with my multimeter. My XLR input tests have a bit more work to do. John Morris wrote: I have been testing my 4K inputs using a 1kHz tone and a meter to look at volts RMS vs recorded db. Thank you, for objective measurements. I thought the mic level gap between the P4K and BMPCC was greater than you report (more like 18db), but didn't have the means to measure with any precision. Just to clarify, was it your finding that 3.5mm line level stereo is also 12db less sensitive than line level on the BMPCC? There are two camps on xlr performance (some reports of fine and dandy, others complaining of the same issue as with 3.5mm), so it will be interesting to see what your findings are, at least for your own unit. Much appreciate the measurements, John Morris. No wonder BMD has commented on better control of noise... they just forgot to mention they crushed the levels to do it. (I may be guilty of overstating it.) looking forward to the XLR levels as only use XLR. As John Paines points out, there’s still a suspicion that audio is not consistent across all copies. Thanks John Morris for the tests. Looking forward to reading your report on how the 3.5mm line level actually is, and the XLR input both mic and line level. John Paines, I will not bother you anymore with my thoughts or ideas. It is comments like yours that have forced the most of the original contributors off this forum. Good bye. Australian Image wrote: Then why does my Olympus E-M1 MkII provide me with the option of turning on power to the 3.5mm mic input? If it's off, the mic doesn't work, if on, it does. It's plug-in power, not phantom power -- different spec, and appropriate that it's available on a consumer camera, but not on a professional one. Unless the camera mics are extraordinarily hot, it's hard to draw that conclusion. The onboard sound is good (for a camera, anyway), and the levels are in the range of normal. I think the 3.5mm issue is a manufacturing defect, but I guess we'll find out. BTW, it's only fair to note that Robert N. came up with pretty much the same measurement for mic level a few weeks ago. It's just semantics as I'm able to choose whether to provide power to an external microphone or not. The E-M1 is not as professional as any other 'professional' stills camera; however, some regard the BMPCC4K as a consumer camera, so why doesn't it conform with your proposition? John Paines wrote: Just to clarify, was it your finding that 3.5mm line level stereo is also 12db less sensitive than line level on the BMPCC? Yes, thats right, at least on my copy. I also thought initially the difference was greater, but that turned out to be inaccurate meters on the old BMPCC. Its probably hard to tell from just a 1khz tone. The response curve and quality can vary on frequency and power. So it's probably worth testing at many frequency points varying power points and a general sweep to pick up any distortion missed, if you think something is a bit off. Is rightmark audio analyzer suitable for this, or has things moved on from those days? The higher sensitivity in mono is probably because the sample is going to one ADC, but you wouldn't think it as its only taking one microphone (I hope). Maybe there is some non linear response there? But, isn't it normal professionally to record lower db to handle highs for a wider dynamic range, as more sensitive equipment will pickup the lower end of the range? Thanks John Paines for the reminder re Robert’s post. Most tv broadcast dialogue in the UK is recorded at about -20 to -12, perhaps the mic amps are optimised for this level? Ray, may I put forward the idea that you are experiencing a problem on your particular camera re the Rode VideoMicro and plug-in power. I have the original BMPCC and my Rode VideoMicro works as it should, although at low level. I do not see why BMD would not include this function on the new BMPCC4K. Others have stated that plug-in power works on their BMPCC4k. It could just be your camera. I have a Beachtek mini mixer specificly made for the BMPCC that does not provide plug-in power, so I understand your frustration. Denny Smith wrote: John Paines, I will not bother you anymore with my thoughts or ideas. It is comments like yours that have forced the most of the original contributors off this forum. Good bye. Denny, I for one appreciate your thoughts and ideas. Please keep them coming. No one is perfect and you have proved that you are the first one to admit this. What I appreciate most about your posts are the spelling mistakes. This flaw gives me a feeling of superiority because I am aware of how smart you really are but how really dumb your iPad is and yet you won't fire the thing. At least my keyboard is smarter than yours. I do not understand why people have to be unpleasant. Plug-in power to the people! I'm interested, as well, but there is no doubt that the P4K's XLR inputs are weak. Compared to every other device I own, the signal is demonstrably lower - unusable with anything but a "hot" mic. Just as an example, with the P4K's gain maxed, it records a lower signal level than the GH5 at minimum. While it's possible this is just my camera, how likely is that, really? To be clear, the Pocket 4K does have plug-in power on its 3.5mm jack, otherwise mics such as the Ohrwurm binaural mic or the Rode VideoMicro wouldn't work at all. With Ohrwurm's creator, Wolfgang Winne of digitalfx, I tested whether the plug-in power of the camera might be too weak. Wolfgang provided me with an independent, 9V block battery-powered plugin-power source that could be put in between the camera and the mic. Unfortunately, it didn't change audio levels on the camera at all. His conclusion (translated from German): "the camera's audio-in must have very low impedance..... that's likely the problem, the camera input strains the microphone too much (almost to the point of short circuiting)." Unlike Wolfgang, I'm not an engineer, so maybe others can think up solutions. Johan Cramer wrote: To be clear, the Pocket 4K does have plug-in power on its 3.5mm jack, otherwise mics such as the Ohrwurm binaural mic or the Rode VideoMicro wouldn't work at all. I have a Rode VideoMicro and Lav+ and neither work unless they receive external power (such as from my LS-14 audio recorder). Even my Cayin amplifier doesn't provide the power required to provide audio to the camera. Ray, I think you should contact your local,BM Support Office and RMA that Camera! Obviously something is wrong there, you need to have the camera tested. has anyone actually RMA'd this camera for the audio issues? Has anyone gotten it fixed? Denny Smith wrote: Ray, I think you should contact your local,BM Support Office and RMA that Camera! Obviously something is wrong there, you need to have the camera tested. I don't see anything wrong with the camera. If the 3.5mm input works when there's a powered mic, then it must be OK. It could be that it works with an unpowered mic but the recording level is so low that even with the Cayin it doesn't register. If I were to send the camera in, I wouldn't see it again until some time after the Christmas holidays. meaning maybe February 2019. Johan Cramer wrote: Wolfgang provided me with an independent, 9V block battery-powered plugin-power source that could be put in between the camera and the mic. Can you provide info on this 9V block battery-powered plugin-power source that can be put in between the camera and the mic. I have been using a Zoom H1 as power source for the Rode VideoMicro when using the Beachtek device that does not supply plug-in power even though it has a 9 volt battery. What were they thinking? I've ordered one of these: https://audio-technica.com.au/products/at9903/ so I can to put the power module between my Rode VideoMicro and Cayin amplifier to provide power to the Rode. This, I hope, will enable me to get rid of the LS-14 audio recorder. Last edited by John Paines on Wed Nov 28, 2018 9:38 pm, edited 1 time in total. Leon Benzakein wrote: Can you provide info on this 9V block battery-powered plugin-power source that can be put in between the camera and the mic. Thanks for the response but I was not able to access the image. I found this by Aputure and wondered if the inline PSU would power the VideoMicro. Only downside is rechargeable battery. Leon Benzakein wrote: I wonder if this would work. I'm fairly certain that would work and I considerer it, but was put off by the very long cable. But what you need to consider is that they don't amplify the sound. Again - there is definitely power through the 3.5mm jack unless the camera has a fault. But the level you can get is so low there might as well not be At least it will run radio mics. Just got the mini xlr adapters. Hope that isn't also very low. I'd like to use the cam for interviews without an extra preamp to worry about. Richard Knight wrote: Most tv broadcast dialogue in the UK is recorded at about -20 to -12, perhaps the mic amps are optimised for this level? I remember Wolfgang, how's he doing? He's a thorough fellow. What was his website again? Wayne Steven wrote: I remember Wolfgang, how's he doing? He's a thorough fellow. What was his website again? b_flow wrote: has anyone actually RMA'd this camera for the audio issues? Has anyone gotten it fixed? I think it's fair to say the camera was not designed this way to serve the British TV market. Leon, that Saramonic SmartRig+ is impressive for the price. May not include any limiter though. rick.lang wrote: Leon, that Saramonic SmartRig+ is impressive for the price. May not include any limiter though. My audio is now excellent, through just a Rode VideoMicro. Some morning tests today picked up even faint bird songs in the distance. John Paines wrote: I think it's fair to say the camera was not designed this way to serve the British TV market. I'm curious about the design reason behind the low recordings in the UK. I know it is used professionally, not just there, and a bane on end consumer releases where you just can't get the volume on smaller systems. Is it just to squash the lower end to make more room for the higher end? I notice (just from memory nor observation) British TV productions seem to be more squashed and clean in the lower end. Of course that's not want you want out in the field live in documentaries, where you strain to dictate levels. Here's a Bluetooth suggestion, a wheel control that let's you ride the audio live. You could pin it to a cage, or stick it on the side of the camera. 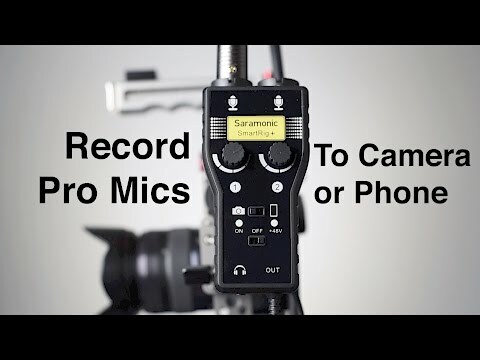 Australian Image wrote: I've ordered one of these: https://audio-technica.com.au/products/at9903/ so I can to put the power module between my Rode VideoMicro and Cayin amplifier to provide power to the Rode. This, I hope, will enable me to get rid of the LS-14 audio recorder. Last edited by Wayne Steven on Fri Nov 30, 2018 12:51 am, edited 1 time in total. I think we’re just holding our breath to hear from BMD on this. If there’s nothing planned from BMD, you’ll certainly generate interest. Good news you have a solution today.